Planning for a trip can be difficult, planning for a trip with kids can be overwhelming, planning for a trip to Disney World with kids is just crazy! But it is the good kind of crazy. You might have seen in my last post my kids love waking up to the Mickey Fairy gifts, check out that post if you have not yet. But that is extra things to pack. We drive so the additional suitcase is no problem, however, it is more to plan for. We are also planning ten days of clothes for four people. There is going to be a lot of laundry when we get home! 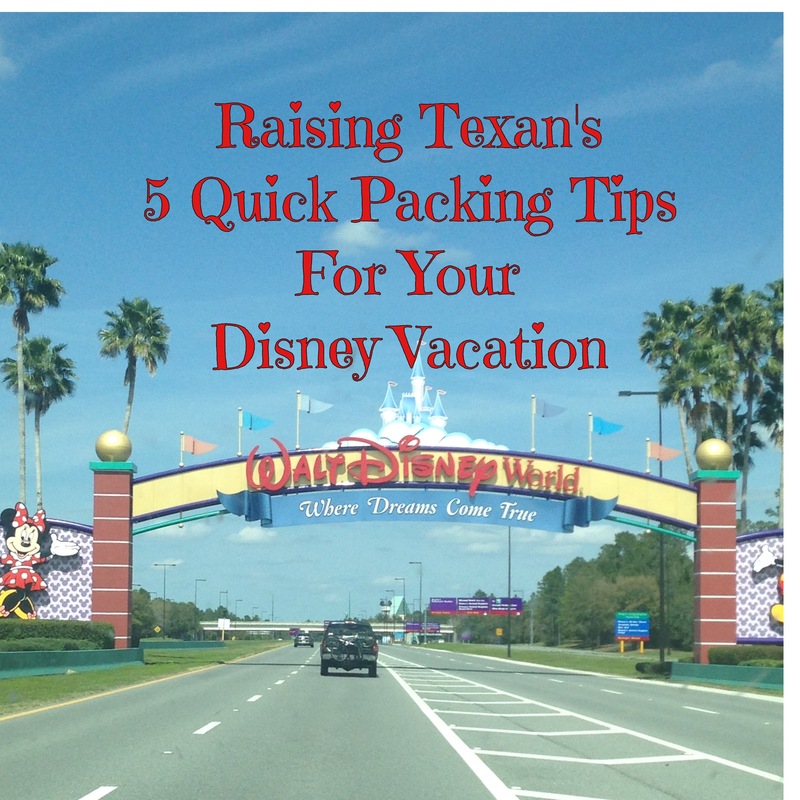 To make this easy for you and for me I have come up with my five top quick tips for packing for Disney World. 1. Take extra: From wanting to change before you go to dinner, to having to change because of a spill or sickness, plan for extra changes of clothes. If you are driving there is always an option to pick up more, but if you have the room, take extra. 2. Be very selective on the suitcases you bring: Some of the rooms are not close to the parking area if you are staying at the resort. While there are great employees there to help, they can sometimes be very busy. Make sure you have good rollers on your suitcases, and that they will store easily in your room. We take three carryon size suitcases and one duffel bag, these easily fit into the closet area in both the Moderate and Value Resorts. The last thing you want to do is to have your luggage take up too much space in your resort room after you have thrown you back out from carrying it upstairs. 3. Be very selective on the backpack/purse you bring: Now that our kids are older we do not have to bring diapers into the parks with us, but we still like to have items with us instead of making a trip to the room. Make sure if you are bringing a backpack or purse it is comfortable. You will be walking miles and miles with this bag, test it out before you go. If it is not comfortable now is the time to invest in something that you will not be regretting half way through the day. We have a hiking style backpack with extra padded shoulders, it works great. I carry a small Vera Bradley mini hipster purse that I got at the Disney Store that I do not have to take off on rides. The combination works great for us. 4. Shoes: Remember what I said about walking miles and miles? Make sure you are ready to walk miles and miles in your shoes. While your new sandals might be perfect for the beach or an evening at dinner, they will not be good for the park. I always take a great pair of tennis shoes and multiple pairs of sandals, and dress shoes if needed. Again, if you have ample space and are driving you can take as many as you can fit. I have been at the park in new shoes that rubbed blisters, it is miserable. Be very selective! 5. Don’t stress: Remember through the whole packing process, you are going on vacation. I truly just needed to tell myself that! If you forget something there is a store or a gift shop close by!